Back in the 1800s, when San Francisco was at the center of the California gold rush, breweries needed a method to ferment beer quickly to meet the high demand of the huge numbers of people arriving to seek their fortune. The process involved the method of training a cool-fermenting lager yeast to work at warmer ale temperatures. This reduced the amount of time the beer would spend in the tanks, thus getting into your mug more quickly. As with most beers that are made today, the processes of producing these styles of beer have been greatly improved. Formerly considered “cheap and low-quality,” these once second-rate beers are now much more refined and quenching. One such example of this style is currently being made by our own Moab Brewing Company, and it is one of the finer specimens of Steam/California Common you’ll find anywhere. Description: I picked up this 16-ounce can at my local Harmons grocery. I love the look of a tallboy can—it’s an impressive sight. I poured its contents into an appropriately sized English ale glass and began to take in the show. The beer is a pale-amber color that has some brassy/gold highlights. It almost has a shimmer as the evening’s sunset shines through the brilliantly clear liquid. Above the lightshow, as the rising pinheads of carbonation work their way up through the body, are two fingers of bleached white foam. The head begins to normalize after a few moments and comes to rest as a simple, sudsy cap. As the foam begins to settle, my sniffer gets down on top of the foam and finds lightly toasted bread that reminds me of browned crust. Cracker-like malts come in next, with pine and the slightest whiff of fruited hops rounding out the edges of the aroma. As Rocket Bike hits my tongue, I get more of those toasty notes from the nose. Big cracker and biscuit punch out immediately with a slight fruity sweetness suggesting toffee, and burnt sugars are present as well. The yeast contributes a slight apple-like twang that complements the fruity sweetness from the barley. This segues into a spicy kick of hops that begins with some drying pine flavors that are on the edge of resinous. Some earthy herbal bitterness pops in, briefly springboarding the subtle dry citrus and rind bitterness that round it all out. The finish is mostly drying, with remnants of the fruity malts lingering in the background. For a 4-percent beer, the body is at near-medium levels with ample carbonation and some residual sweetness. 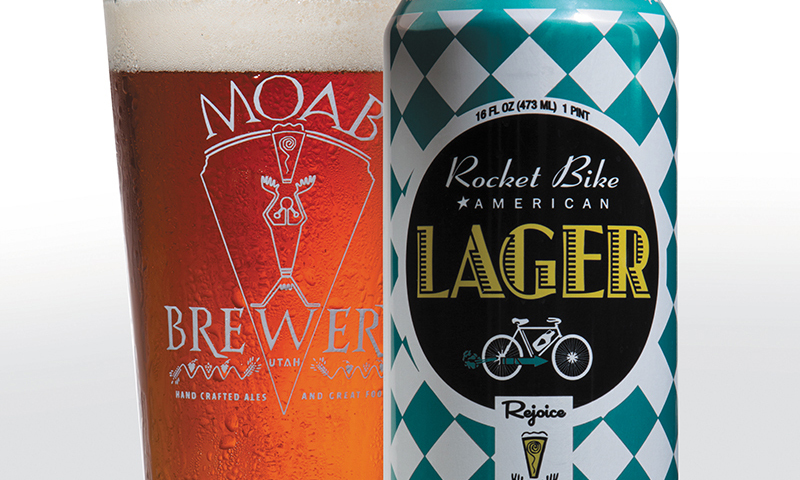 Overview: Rocket Bike has a quenching, classic lager feel that is well complemented by the great use of toasted grains. Its simple but well-layered approach provides an easy-drinking experience that is satisfying but not overly complex. This is a great example of style, and Rocket Bike has the awards to back it up—boasting three gold medals from the North American Brewers Association and a bronze medal from the 2014 Great American Beer Festival. Rocket Bike is available year-round in Utah.